Dr. John Sterman of MIT Sloan and Climate Interactive had the honor of speaking to UN Secretary General Ban Ki-Moon yesterday in New York on the occasion of the entry into force of the Paris Agreement. 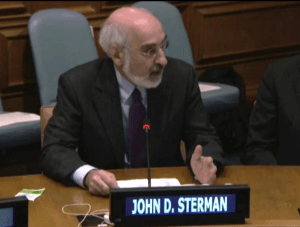 Dr. Sterman represented a group of scientific NGOs that have been critical to elevating climate science in the negotiations, to the media, and out to the broader public. Among them were Climate Interactive, the Union of Concerned Scientists, Climate Central, and Carbon Tracker. Check out the video and transcript of his speech below. Meeting between the UN Secretary-General and civil society representatives on the occasion of the entry into force of the Paris Agreement on climate change. Friday 4 November 2016, 10 AM, UN Headquarters—Conference Room 8. Thank you, and thank you Mr. Secretary General for the opportunity to share in this great day. I am a professor at MIT, and director of the Sustainability Initiative at the MIT Sloan School of Management. Today I am also proud to represent a group of civil society organizations including the Union of Concerned Scientists, the Carbon Tracker Initiative, Climate Central, and the group I work with, Climate Interactive. Through our work — and that of many others — people all around the world now know that the Paris agreement coming into force today is a giant step forward, and, at the same time, that greater ambition—earlier, deeper emissions cuts—is needed to create a world in which all can thrive. And we know that, together, we can do it. Each of our organizations contributes to this vital work. Climate Central translates the best available science for the public, for example, showing how rising sea levels will devastate many of the world’s great cities unless we act now. Union of Concerned Scientists translates complex scientific and policy issues with rigor and clarity, and has been speaking truth to power since 1969. The Carbon Tracker team have shown that the vast majority of fossil fuel reserves are grossly overvalued, and how companies can create wealth by embracing the clean energy revolution now underway. And the Climate Interactive-MIT team creates free, interactive simulations enabling everyone to learn for themselves what each nation, and each of us, must do to limit warming to “well below” two degrees Celsius. Many of us will be in Marrakech, continuing our work with policymakers and negotiators. But we also know that broad public support for action is essential. Research shows that showing people research doesn’t work. So we develop interactive tools that empower people to learn for themselves. Tools such as Climate Interactive’s “World Climate” workshop, in which people play the roles of the negotiators, then test their proposals using our C-ROADS simulation model, explore sea level rise through Climate Central, and learn the science and economics through the work of UCS and Carbon Tracker. We are profoundly grateful to you and all those who brought forth the Paris agreement, and we pledge to redouble our efforts to turn that promise into reality.